Both Visual Studio and Atmel Studio have powerful built in tools that help you when navigating through your code. It is absolutely worth learning to use these functions. In this aspect, Visual Studio and Atmel Studio differ substantially, because they use different software tools for that purpose. Atmel Studio uses an add-in product, Visual Assist from Whole Tomato Software. This add-is part of the Atmel Studio installation. You can find Visual Assist's documentation here. 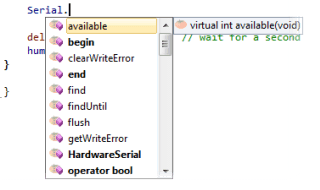 Microsoft Visual Studio has similar functions already built in. You can find the documentation for Visual Studio here.